If you have previously purchased a Lockey lock with a key override from us, you can order extra Lockey keys here. For security purposes, if you already purchased your lock on a separate order, we will send you key blanks and you will have your locksmith make a copy, as we do not keep a record of customers keys. However, if you make your purchase at the same time as your lock, then depending on the lock model, we may be able to send you keys that are already cut to match. For best results, contact our office for details about our extra keys and key blanks for sale. 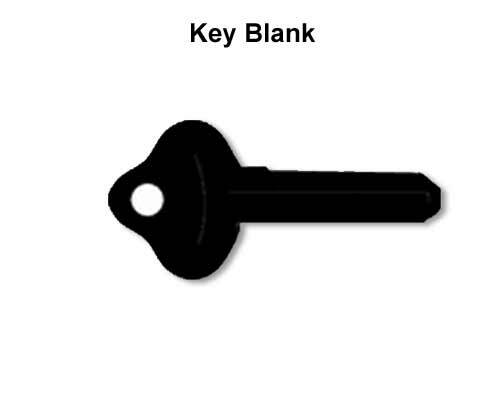 For your protection, our key blanks are NOT available in stores, but you can order a key blank from us here and have your locksmith make a copy for you. First, you will need to determine if you have a left-handed or right-handed key. To do this, hold your key in your hand as if you were going to insert it into your lock. Make sure that the teeth of the key are pointing up. Then, look to see what side of your key the groove is carved into. This is a pencil-thin groove that runs along the length of the key below the teeth. If the groove is on the left,then you need a LEFTHANDED key blank. If the pencil-thin groove is on the right, then you need a RIGHT-HANDED key blank. Select the proper option for you and add to your cart. Then, in the special instructions box during checkout, be sure to specify the number on your key, if you know it. Or, if you don't know it, let us know why. Lastly, include the mailing address and email address you used to place your original lock order if it has changed since you purchased your lock. If you don't know it, then tell us as much as you can about your order, so that we can identify you as the original customer. Extra keys are not available for the Lockey SL910. However, this lock has a Kwikset key way, so you take it to your local hardware store to get a duplicate key made.